"The Art of Peace does not rely on weapons or brute force to succeed. Instead we put ourselves in tune with the universe, maintain peace in our own realms, nurture life, and prevent death and destruction. The true meaning of the term samurai is one who serves and adheres to the power of love." 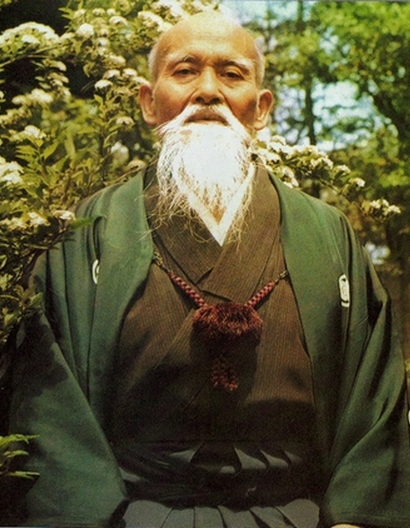 As a child, Morihei Ueshiba (1883-1969) saw his father beaten by thugs. He vowed to become strong and mastered many martial arts, but was troubled by the war and violence he saw in the world. 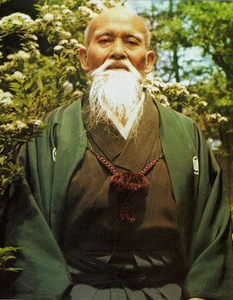 He experienced a vision in which he saw that the true “way of a Warrior is to manifest Divine Love.” He dedicated his life to finding a way of gentle strength and so Aikido – "The Way of Harmony with Life Energy” was born through him. He taught the Art of Peace as a creative mind-body discipline, as a practical means of resolving conflict without inflicting injury, and as a way of life that fosters fearlessness, wisdom, love and friendship. He believed that Aikido could be applied to all the challenges we face in life – in personal relationships, as we interact with society, at work and in business, and when dealing with nature.